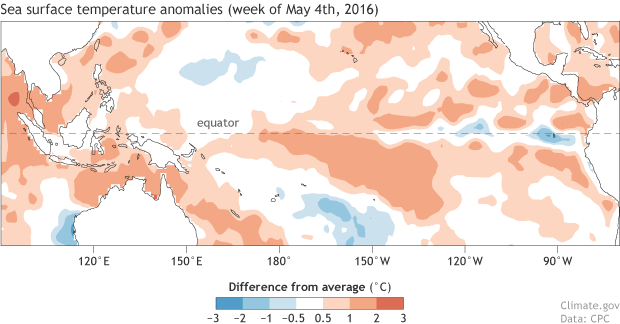 May 2016 El Niño/La Niña update: Switcheroo! There’s a 75% chance that La Niña will be in place by the fall, meaning sea surface temperatures in the central Pacific at the equator will be more than 0.5°C below average. It’s possible the transition from El Niño to La Niña will be quick, with forecasters slightly favoring La Niña developing this summer. What’s behind this reasonably confident forecast? Sea surface temperatures in the Nino3.4 region, our primary index for ENSO (El Niño/Southern Oscillation), have been cooling steadily since they peaked at 2.4°C (4.3°F) above average back in November. Recently, cooling has accelerated, and April was 1.2°C above average using ERSSTv4, our most historically consistent sea surface temperature dataset from NOAA NCEI. Monthly sea surface temperature in the Niño 3.4 region of the tropical Pacific compared to the 1981-2010 average. Temperatures have been falling rapidly since late winter. Climate.gov graph based on ERSSTv4 temperature data. Despite these lingering signs of El Niño, the trend toward neutral conditions (Nino3.4 SST within 0.5°C of average) is very likely to continue. Most computer models are predicting El Niño conditions will come to an end in the early summer, and that sea surface temperatures will continue to drop, potentially passing the La Niña threshold (0.5°C below average) sometime in the summer. Some areas of near- or below-average sea surface temperatures have already appeared in the eastern Pacific. 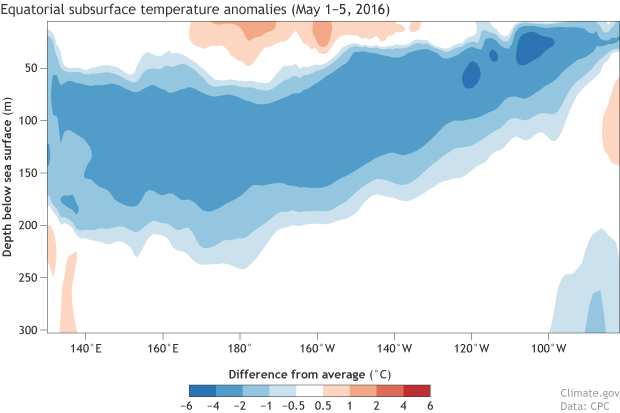 Sea surface temperatures during the week of May 4, 2016, compared to the 1981-2010 average. A few pockets of cool water have appeared in the eastern tropical Pacific (image right). Climate.gov figure by Fiona Martin, from CPC data. Along with the computer models, another feature that is lending confidence to the forecast for a La Niña is the amount of cooler-than-average water under the surface of the Pacific. This large pool of cool water stretches across the entire Pacific, along the Equator, and extends down from just below the surface to around 500 feet. Cross-section of the equatorial Pacific Ocean for May 1-5, 2016, showing subsurface temperature (0-300 meters) compared to the 1981-2010 average. A large area of water that was 2-4 degrees Celsius cooler than normal had pooled up beneath the surface at depths of around 100-200 meters. Climate.gov figure by Fiona Martin, from CPC data. There are 14 La Niña events in our historical record, going back to 1950. (There are 23 El Niño events in the same record). 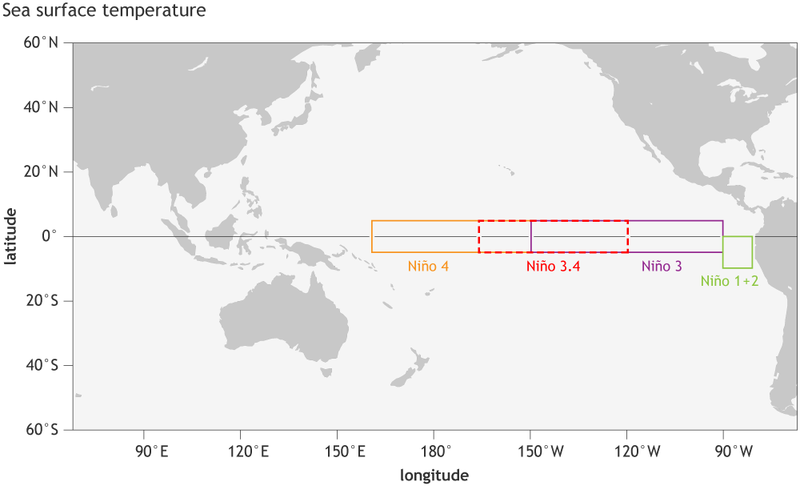 To qualify as a La Niña event, the three-month-average sea surface temperature in the Niño3.4 region (the Oceanic Niño Index) must remain at least 0.5°C below the long-term average for five or more overlapping three-month periods. Like El Niño, La Niña tends to peak in the late fall/early winter. Peak La Niña temperature anomalies (anomaly = departure from long-term average) do not tend to be quite as big as peak anomalies during El Niño, with the strongest on record being -1.9°C during November–January 1973/74. For reference, the 1997/98 El Niño and this past winter’s El Niño peaked at 2.3°C. Of those 14 La Niñas, nine immediately followed El Niño years. Two occurred two years after an El Niño, with a neutral year intervening. Two were the second year of a “double dip” La Niña, where sea surface temperatures briefly returned to neutral during the summer before heading back into La Niña territory (1974/75 and 2011/12). The remaining one starts the records off in 1950. In short, all La Niña events in our record have started within two years of an El Niño. (But not all El Niño events are followed by La Niña.) 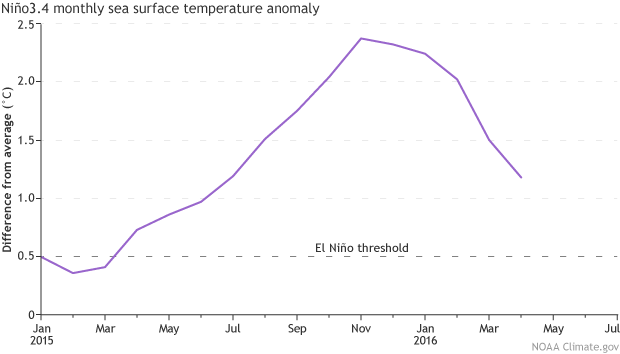 El Niño does not have a similar rule, as several of the 23 El Niños on record have started four or more years after the last La Niña. La Niña events often last longer than El Niño events. Only once on record has El Niño lasted through two straight winters, 1986-1988, but it has happened with La Niña three times. The La Niña event that followed the 1997/98 El Niño lasted for thirty-three months, through three winters! 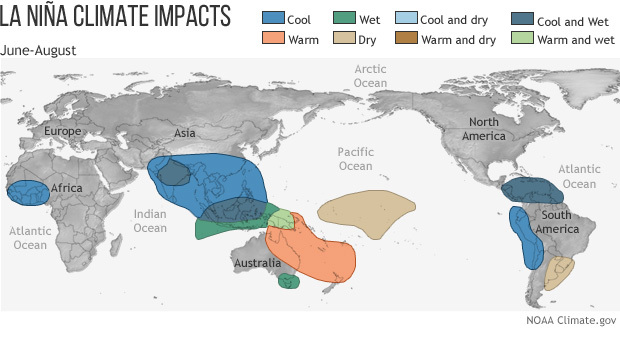 During July – August, La Niña has limited impacts on the northern hemisphere weather, with the exception of the hurricane season (it can contribute to a less active Pacific, more active Atlantic). There are some typical effects in the southern hemisphere during this season. Typical rainfall and temperature patterns in the Northern Hemisphere summer during La Niña events. Most of the impacts are confined to the tropics and the Southern Hemisphere sub-tropics. These patterns become more likely during La Niña events, but they are not guaranteed. NOAA Climate.gov map. Over the next few months, we’ll get into the effects we can expect during a La Niña winter, as well as some of the how and why. Stay tuned! How will this effect the E. Pacific Ocean = Mexico? Many people are concerned. Well Mexico will basically end up being pulvarized by horrible storms and eventually sink into the ocean. Then Trump will not need to build his ridiculous walls!! Why are there so many more El Nino episodes vs La Nina since 1950 when the climatological probability on the weekly CPC/IRI Probabilistic ENSO Outlook shows close to equal probability of either for any given month? Very good question! One quick note: the climatology line in the CPC/IRI probability is based on 1981-2010 only (this has to do with the fact the World Meteorological Organization (WMO) recommends national meteorological services use this as a modern era baseline). Regardless, keep in mind that La Ninas can last for multiple years while El Ninos do not. The climatology line is per season and doesn't care whether La Nina has lasted for two years or one. So you can have more (shorter) El Nino episodes and fewer (longer) La Nina episodes and they balance out for an individual season (i.e. just within NDJ). Hope that makes. Because we were in a 30 year ADO and PDO phases with the oceans. Now we are negative, negative phase. Hence cooling is coming. 1. The Recharge Oscillator theory states that the ocean is 'recharged' during a La Nina, and 'discharges' heat polewards and eastwards during an El Nino - how does this compare against the delayed oscillator - are they separate competing theories or do they complement/ (involve feedbacks) with each other? 2. From your lag-correlation results (see recent post by Anthony Barnston), there seems to be plenty of scatter or 'noise' in the evolution of ENSO. To this end, could La Nina manifest without first being 'prompted' by an El Nino? For example, are the dynamics underpinning neutral-La Nina or back-to-back La Ninas different from your discussion here about a La Nina that follows an El Nino? 3. Ok - maybe pushing my luck here with your patience, but is there a reason (mathematical or physical) why there seem to be a whole spectrum of El Ninos (https://www.climate.gov/news-features/blogs/enso/enso-flavor-month) i.e. Modoki, Classical , while La Nina's tend to be more 'stable' and have their max SSTAs concentrated more in the Central Pacific? (1) In the literature, these two mechanisms of ENSO are usually discussed seperately. This is mainly because their derivations are based on different assumptions so technically they are different. For example, the recharge-discharge mechanism is based on a derivation that essentially filters out oceanic waves which the delayed oscillator theory depends on. However, it's important to recognize that in the real world, we often see combinations of both. For example, right now we're seeing discharge of heat content (e.g. recharge-discharge), but this was preceded by an upwelling Kelvin wave along the equator (e.g. delayed oscillator). So I don't think most ENSO scientists see these mechanisms as competing, but complimentary with somewhat different emphasis. That's my impression anyways! (2) The transition from El Nino to La Nina tends to be more straightforward and predictable than the reverse. This is related to the fact that the primary ENSO mechanisms describe this process fairly well. Where these mechanisms get "stuck" and where predictability is more limited is in the build-up phase to an El Nino. It is not as common to see La Nina transition into an El Nino. There are papers out there that hypothesize why La Nina lasts multiple years (see papers by Deser/Okumura and McGregor) and El Nino does not. Most identify the different configurations of the La Nina vs. El Nino spatial structure as culprits for why they do to not evolve similarly, but a smoking gun cause is elusive and is still a matter of research. (3) The prominence of certain feedbacks over others tends to "explain" why SST anomalies in association with El Nino and La Nina can set up in different locations. A nice paper that explores this is Kug et al. 2010, which is available on A. Witternberg's site: http://www.gfdl.noaa.gov/~atw/yr/2010/kug_etal_2010_jc.pdf . Thanks very much for your prompt and insightful response Michelle - and yes, I do have some prior ENSO knowledge, although it is hazy, disparate and out dated! The fact that researchers seem more focused on El Nino's rather than La Nina's is curious to us in the insurance industry here in Australia (as La Nina's are associated with higher flood risk and increased cyclone activity hence increased economic losses!) - and your explanation about the more capricious nature of El Nino does address this to some degree. How can any forecast about El Nino be more than educated guesswork with only 65 years of data? Wouldn't you need hundreds of years of data to be accurate in a forecast within a few percent? Just because there has been no 3rd year El Nino within the last 65 years does not mean there will not be one. Where were the so called cooler temps measured at? Not the cold current up swells near the Galapagos surely? It seems that way from the temp models I have seen. If the "lower" temps were nothing more than localized Antarctic current up swells caused by the underwater mountains of the Galapagos island chain then we have a model that has been seriously skewed. Unless the cold underwater currents broaching the surface near the Galapagos island chain are precursor events forecasting the ending of an El Nino AND that they do not happen during El Ninos it would be unwise to point to cooler water near the Galapagos as forecast for anything as of yet. Has anyone defined the effect on El Nino's (if any) caused by the underwater mountains of the Galapagos? Otto, the "so-called" cooler temps are measured in-situ and are anomalies, not temperatures. That is, the water isn't *cold* or sourced from Antarctica, it's cooler than the norm due to a shift in the thermocline, part of the ENSO "seesaw". See Michelle's answers below for more information. Good article! If the El Nino switches to be La Nina, what is the expectation of this summer? Cooler or hoter in the NorthEast Region? effects of the El Nino? I've found these articles of great use! However, before shifting to the La NIna, a look back at the El Nino would be helpful. The US public was given two years of warnings about the "super monster" "Godzilla" El Nino. How did its effects compare with the predicted devastation -- and with the average weather over that period? These comparisons of prediction and reality are imo as important as predictions. NOAA is one of the few sources with the resources, credibility, and neutrality to provide them. RE: effects of the El Nino? Thanks for the compliment! Shortly, I think Tom will do a verification post on the DJF winter outlook over the U.S. (temperature and precipitation). As for verification of the ENSO forecast itself (e.g. Nino-3.4) we're currently putting together a manuscript that will address this and also provide an overall retrospective of the 2015-16 event. If that paper is accepted and released, we'll put a note somewhere on the blog about its availability. RE: RE: effects of the El Nino? Thank you for your excellent articles here, and especially for the link to that paper. That is clear and helpful, a great start to analysis of this event -- one so intensely hyped for two years. I will post a summary at the https://fabiusmaximus.com website (with a full citation and link to your paper). I hope NOAA provides more analysis of this event and its effects! The subsurface temperatures are anomalies or deparatures from average, so the best way to think about where the below-average temperatures came from is to think of it as a displacement of typical subsurface waters. A good way to visualize this is to check out this animation which shows both the *total* temperatures (bottom panel) and the *anomalies* (top panel). What is happening now is that the thermocline (which is that 20degC black contour in the bottom panel) is getting closer to the surface. As a result, the subsurface temperatures are below-average, with the largest temperature anomalies close to where the thermocline is normally. We've been tracking the upwelling phase of a Kelvin wave (more here), which kicked off a couple months ago and is resulting in the displacement of the thermocline and below-average suburface waters. Why did it form? Well it may be the inevitable result of the decay of El Nino. We're aiming to write an article on one fairly prominent ENSO mechanism coming up in the next month, so stay tuned. Thanks for your great blog and responses. I'm really interested in this topic also. I hope you post a link to your article or the findings. Does the apparent change in the subsurface of the ocean floor to a warmer stage have anything to do with the El Nino/La Nina's? Hello, I am from Argentina, Mendoza. How long estimate the occurrence of rain in the Argentine West? Will this bring more snow amounts in the winter? How la nina effect weather patters over europe over the summer, fall and winter this year? can you please explain as to how this will affect those of us who live in the desert here is arizona, or will it affect us at all ! drier/wetter cooler/warmer ? What are the highest/lowest recorded surface-air temperatures in the 3.4 survey area (or where can I find these data)? In the media, I'm always reading about record temperatures in Siberia, but I want to know about the Pacific - since it seems like events in the Pacific have consequences for the rest of the world. You can get monthly NINO3.4 data here. Bear in mind that these are detrended anomalies, so 'absolute' warmest/coolest will depend on retrending the data. But if you want to compare ENSO strength by SSTs, the detrended data will do. I was wondering what would the general weather characteristics be for the NE CONUS be for Sept-Nov 2016. It sounds link more rain and cooler temps may be in the offing if the patterns continue. Right now it shows a tilt toward above-average temperatures for the northeast during SON 2016. For precipiation, it is "EC" or equal chances which means all categoreis are equally likely to occur (we don't know). No significant influence of the NAO on ENSO has been documented thus far. They work on different timescales, with NAO/AO changing on subseasonal (approximately weekly) timescales, and ENSO lasting in one phase for many seasons. The NAO/AO do have a strong influence on North American weather and climate, especially during the winter. Hi, I need to translate some of these graphs to spanish, but I haven't been able to find QGIS data. I downloaded the weather and climate toolkit, but I still haven't found this particular piece of information. Do you know where it might be? I have read the last few El Niño updates and they all predict La Niña to follow soon. That suggests a drop in temperatures. In the Southwest, especially in Texas we've been dealing with devastating flooding events almost weekly, since April. I'm just wondering how these temperature drops seem to have little to no effect on the amount of rain we're getting here. I did see that you mentioned a more active Atlantic hurricane season this year...is that all in line with the historic rain events we are currently experiencing? The extreme rainy pattern in Texas over the past few months is not likely attributable to ENSO. All the rain in Texas may lead to a cooler summer, though: check out this recent article posted on our sister blog, "Behind the Data". I live in northwest Ohio and am interested in how these two El Niño and La Niña systems will affect this ares for 2016-2017? I am not entirely understanding the weather pattern and the effects. Do the oceans and wind have that great of an effect and or it the pulling of the moon's gravitation on our the oceans that causes the weather patterns seasonally creating heavy snows or rains?